ONE NIGHT STAY AVAILABLE SUN-THURS, OR IF PART OF THE WEEKEND IS BOOKED. TWO NIGHT MINIMUM ON THE WEEKENDS. SORRY NO PETS, CHILDREN OR BABIES ALLOWED. Same day bookings accepted call Denise at 209–662–4135. Thank you! CANCELLATION POLICY: if you cancel and the days that you cancel are rebooked your money will be refunded in full. If they do not re-book there will be no refund. This Charming Fairytale like Cottage is located in Downtown Murphys. It is always decorated for the holidays and the season. You can walk to over 20 wine tasting rooms, upscale restaurants, boutiques, spas and much more. You may park your car and never use it until your departure. Or you can drive 1 mile to Mercer Caverns, 2 miles to Ironstone Winery, about 5 minutes to Moaning Caverns. Drive 20 minutes up Highway 4 to visit the internationally known Big Trees State Park and see trees over 2000 years old! The queen bed has a pillow top mattress that is sooooo comfortable! Bear Valley Ski Resort is less than an hour away offering downhill, crosscountry and snowmobiling. Nearby Stanilaus River, Utica Lake, Union Lake, Spicer Reservoir and New Melones Lake offer fishing, hiking, swimming and boating. The Gold Rush town of Columbia is just 20 minutes away too! Year round, there is always something to enjoy when you visit Murphys! 1 night stays available during the week and on the weekend if someone else books the other weekend date. Welcome to my little cottage! I have been an art teacher, a professional artist and a realtor in my past. This is my favorite time of life right now taking care of my little charming cottage in downtown Murphys. The cottage is spotless clean and welcoming! I love to garden and decorate and bake goodies for my guests. I enjoy decorating the cottage for every season and holiday. I live next to the cottage in my own little cottage which is always convenient in case you need anything. Your stay will be a pleasant one to remember! This charming cottage is only 1 block from Main St! You will choose your own digital code to unlock the front door. Previous guest codes will be deleted upon their departure. You can feel safe that no one else will be entering the cottage during your stay! To quote many of the guests that have stayed here, " I will never stay in a motel again while visiting Murphys! 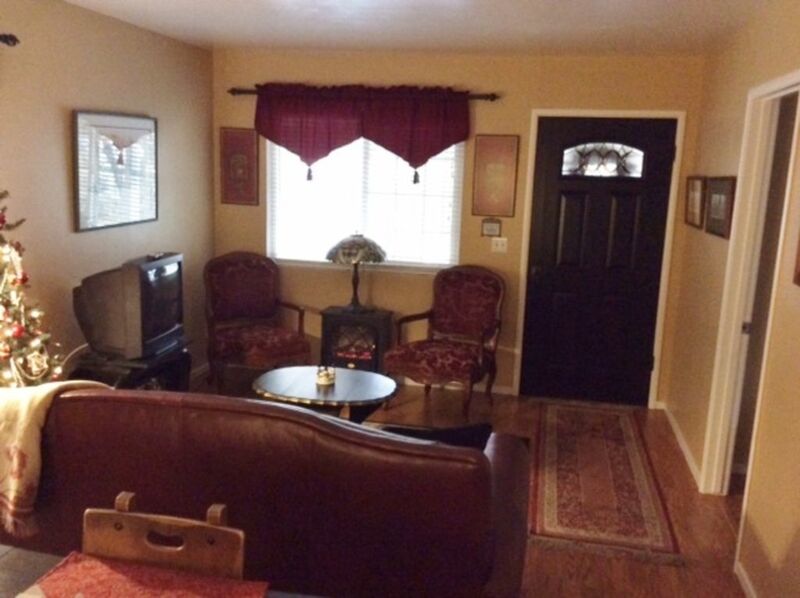 I love coming back to this charming comfortable cottage that is so close to everything downtown!" Step outside to smell the cinnamon rolls baking half a block away at the bakery on Main St. What a great way to start the day! The tiled tub/shower bathroom is off of the dressing area which is through the bedroom. Towels, liquid soap, shampoo and conditioner, toilet paper, kleenex, hair dryer, hand mirror, sewing kit, iron & iron board are provided. Electric stoves that look like propane with nice ambiance in the living room and bedroom. There is a completely stocked kitchen. Well stocked with appliances, utensils, cooking pots and pans and almost every kind of glassware and charming dinnerware. Also outdoor dining and chairs on the porch. Three sides of the cottage have a wooden covered porch with seating. There is a seating area with a picnic table on the front, and side of the house. Seating on all 3 porches. Bear Valley, under an hour away when the roads are clear. Massage and day spa available in downtown Murphys. We have stayed here twice now and both times have been an absolute pleasure! The cottage is charming and cozy and has everything we need. We love that it is a short walk to downtown but far enough removed that it is a quiet oasis.The owner, Denise, is lovely also. We would stay here again and would highly recommend it to anyone visiting the beautiful town of Murphys. This was an excellent location. We were made to feel welcome and right at home by our host and staying here helped us enjoy our trip so much more. Very clean. The pictures are very accurate! We loved it! The owner Denise is wonderful! Greets you with a smiling face and is very helpful. The home is literally steps from downtown Murphy’s! It is the perfect little place. We can’t wait to go back! Great location, very nice, romantic place to stay. Quiet, clean, had everything you need. Couple minutes walk to downtown. Denise was very helpful & friendly. We would defiantly stay here again. Me & a couple of gal pals visited Murphys Feb 16-18, 2018 for my birthday. It was a fabulous trip. It was easy to book & Denise is so sweet & contacted me right away. She provided so much information & informed that I was arriving just in time for Presidents Day Wine tasting festival. Denise welcomed me & my friends with open arms & a Happy Birthday banner.....that was so special to me. Denise even baked a delicious pumpkin raisin loaf....she went out of her way to make us feel comfortable. I truly would stay with her again. Thank you Denise for allowing us to stay in your beautiful cottage. Denise, the owner, lives behind this cottage and she was an exceptional host. She checked in on us without encroaching on our privacy. The cottage is small and perfect for 2 people. We were there on the hottest weekend (temps of 100+) and the AC and ceiling fan kept us cool. The cottage was a great place to avoid the midday heat. This cottage is perfectly located, within walking distance to everything in Murphys. We were extremely glad we booked in Murphys over some of the larger towns like Arnold. It was a real pleasure and we hope to be back soon. Don't miss Mercer Caverns, only 1 mile away! One night stays are available on Friday, Saturday or Sunday night if Friday or Saturday night is already booked as a two night stay. One night stays are also available during the week I will show you around the cottage about five minutes after you arrive. Please let me know the approximate time that you think you will be arriving. There is a security camera on the carport and I will watch for you to arrive. The service fee does not go to the owner it goes to VRBO.com. CANCELLATION POLICY: if you need to cancel, your payment will be refunded if that night rebooks.